You really can't go wrong with a David Sedaris audiobook. This was a true listening pleasure. I laughed out loud many, many times, as one would expect. But it's also a tender book. Amid Sedaris' traditional humorous observations and stories come stories about his sister Tiffany, who committed suicide; his mother, who died at age 62; and his aging father, who refuses to move out of his home despite his frailties. 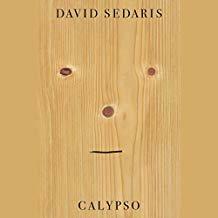 Sedaris is a narrator troubled by guilt -- over refusing to see Tiffany the last time she came around; over no one in the family willing to confront the mother; and not seeing his father too often. Every person who thinks they should write a book because they've been told they have so many funny stories should read this. They will learn that humor needs to be balanced with humanity and a willingness to bare deep secrets and shine the light upon dark closets of the soul. Sign into Goodreads to see if any of your friends have read Calypso.